Another month is coming to an end, October starts next week. Time to share my project inspired by this month's tag on Tim's blog. Tim is such a good teacher so I just followed his steps and I have never had so much fun with alcohol inks. I love this image of a young woman's face that I ended up using on my tag, such a beautiful stamp. Oh and I have a couple dozen extra butterflies for another project! Thanks for stopping by! 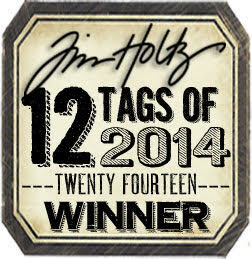 Congrats on your Win and TimHoltz.com!